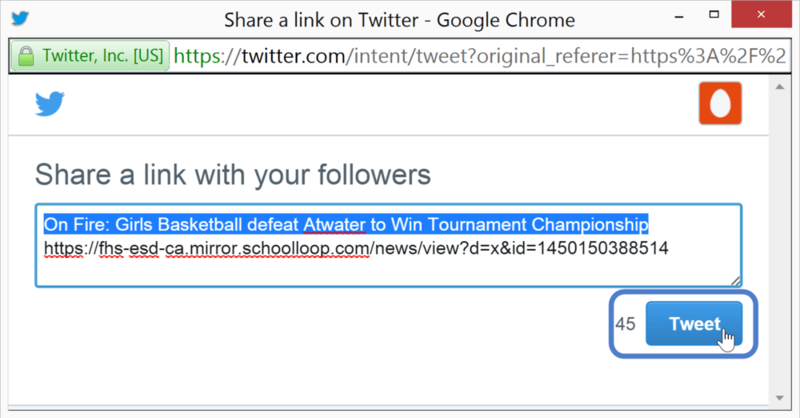 When posting news and events to your website, you can easily share those posts on Facebook and Twitter. Please note that you cannot share posts intended only for an internal audience such as a group or all students. After clicking the publish button to post your news or event, you'll have a chance to review your published content. If all is good, click the Share or Tweet button and you will be prompted to enter your credentials if not already logged into your social media account. In the pop-up window, click Tweet or Post to share on your social media. Congratulations your news item or event has been shared! Shared news and events on social media will be one of the posted feeds (e.g. Facebook news feed, etc. ).